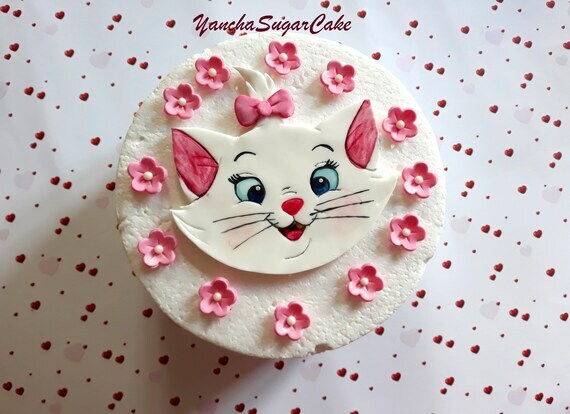 This listing is for Marie Aristocat edible fondant 2d cake topper, it comes with 12 flowers as in the picture. Sugarpaste is 100% edible. It is suitable for vegetarians and gluten-free. You can choose the flavor of sugarpaste - vanilla, strawberry, banana or chewing gum. We are very careful about the expiration day - it is included in each order. Fondant decorations stay fresh for about 6 months after their construction. Dummy cake in the picture is 8" in diameter, the approximate size of the Marie's face 14x12.5 cm (5 1/2x5 inch). All sugar decorations must keep away from direct sunlight and do not store in the fridge or freezer. They should be stored in an air-tight food container in a coll and dry place. For other countries please see the shop's policies.